Feeding a farmer during planting and harvest season is not always an easy task and more than likely every farmer has their own "rules" for eating when they are busy in the fields. Over the past 13 years, I've tried to learn the "rules" of The Farmer and his dad, but even then it isn't foolproof. However, I will say that these 8 tips usually serve my mother-in-law and I well. Supper will never ever be at the same time every night especially during planting and harvest season so we must be flexible as well as the meals we make and/or buy. A slow cooker can be your best friend, especially one with a keep warm feature. Sometimes fast food or carryout from a restaurant are your best option. Easy to eat is essential. Planning is good essentially when it comes to meals, but you must also be flexible that plans can always change. Never try to guess what they are thinking. Sometimes they will want to grab their food and go and sometimes they will stop and eat with you on the tailgate of the truck. Be flexible, never take it personal, and enjoy every moment as some of our kids' best memories involve taking dinner to their dad or grandpa and sneaking in a ride in the tractor, combine, or semi. 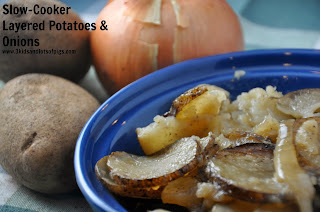 So while following #1, #2, and #4, and possibly #5, #6, #7, and #8, I'd like to share this quick and easy recipe from Gooseberry Patch's Hometown Harvest for Layered Potatoes & Onions. In a slow cooker sprayed with non-stick vegetable spray, layer 1/4 each of potatoes, onions, and butter; add slat, pepper, and some chives. Repeat layering, ending with butter and seasonings. Cover and cook on high setting for one hour. Turn slow cooker to low setting; cook for 5 hours more. Serves 10-12 or one hungry farm family. Be sure to enter my giveaway to win your very own copy of Hometown Harvest! 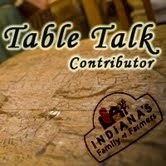 Additionally, I am participating in Indiana's Family of Farmers Table Talk Series and received a gift in exchange for my participation. I'm one lucky girl! Great tips! I think we use all of them here! Be safe!